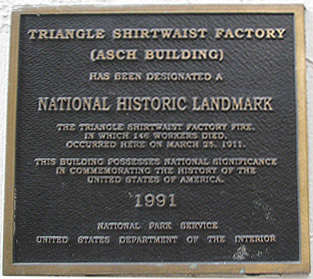 One hundred years ago today, the industrial fire at the Triangle Shirtwaist Company caused the deaths of 146 people and changed labor laws and New York City forever. One of the employees who died because of the fire was a young Russian immigrant named Frieda Welikowsky. She had been in the United States for less than two years. Frieda was born in Liady, Mogilev gubernia, Russia (now Lyady, Belarus) about 1890. She had three siblings -- Alter, Lea, and Fannie (we don't know Fannie's Yiddish name, only her American name). All four siblings came to the United States in search of a better life. Fannie, who was already married and had a daughter, came first with her husband. Next was Frieda, who arrived at Ellis Island on July 19, 1909. Her occupation listed on the ship manifest is "tailoress." Because she was a young woman of child-bearing age traveling by herself, and therefore a "likely public charge" if she did not have someone here to support her, she was detained until someone came to pick her up. She waited less than a day before her sister Fannie collected her. Frieda apparently found a job in the garment industry fairly quickly. In the 1910 census, she was enumerated on April 22 while living with her sister Fannie and her sister's family, and her occupation was "waist operator." This meant she used a sewing machine and actually constructed garments. Waists, or shirtwaists, were essentially what we would now call a blouse. They were a relatively new fashion item (previously women wore one-piece dresses or bodices that matched their skirts) and were extremely popular. Frieda was working on Saturday, March 25, 1911. Being Jewish, she would probably have preferred not to work on the Sabbath, but if she didn't work she might have lost her job. So she was in the factory when the fire broke out. She was one of the employees who braved jumping out of the building rather than burning to death inside. The fall did not immediately kill her and she was taken to New York Hospital. In a New York Times article of March 28, 1911, however, a short note near the end mentioned Frieda and that "little hope was held for her recovery." On March 29, a Manhattan coroner filled out the death certificate for Frieda, who had died on March 28, the day the Times article was published. The cause of death was "shock & multiple fractures; jumped from burning building." Later on March 29, Frieda was buried at Mount Zion Cemetery in Queens. Lea and Alter, Frieda and Fannie's other siblings, never saw Frieda again after she left Russia. Lea arrived at Ellis Island on September 23, 1911. Alter arrived in Boston on August 28, 1912. Last year, I spoke several times with Michael Hirsch, the amateur historian who worked obsessively to determine the names of the six victims who had remained unidentified after the fire. He has done an immense amount of research on the Triangle Fire and its aftermath. He told me that Frieda had given important testimony to investigators before she died. He at first questioned whether her name was actually Welikowsky, because he said the Workmen's Circle, in whose plot Frieda is buried at Mount Zion, worked closely with the family members of the victims buried there, and her name on the gravestone is spelled Palakofsky. He could not give me an explanation for the significant difference in spelling, but my research and documentation apparently convinced him that Palakofsky was not correct, because Frieda is in the official list of victims under Velakofsky, a linguistic variation of Welikowsky. HBO and PBS produced documentaries to commemorate the 100th anniversary of the Triangle Fire. Michael Hirsch was a coproducer and one of the writers for the HBO program, Triangle: Remembering the Fire. The PBS program, Triangle Fire, said that only one person survived jumping out of the building, which is misleading. A few people in addition to Frieda survived for at least a couple of days after they jumped. I am not related to Frieda. I researched her and her family as a mitzvah (good deed) for a friend of mine last year. My friend's brother wanted to do a big family tree project for their mother's 85th birthday, and I agreed to help. I became particularly interested in Frieda not only because of the tragedy of her short life but also because the story of the fire made me think of my own family. My great-grandfather Joe (originally Joine, pronounced YOY-ne) lived in Manhattan in 1911 and also worked in the garment industry. 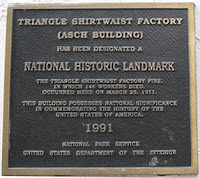 He didn't work for the Triangle Shirtwaist Company, but the fire could have happened at almost any of the businesses. He probably knew some of the people who worked at Triangle. He may have marched in some of the labor protests before and after the fire. Fast forward to 1980. My grandmother, Joe's daughter, was working at the MGM Grand Hotel in Las Vegas, Nevada. A fire in the building claimed 87 lives. My grandmother got out, but she always talked about one coworker who had come out with her but then went back inside because she had left her brand-new coat. The young woman didn't make it back out the second time. I remembered that story while I was watching the HBO special, which mentioned Joe Wilson, one of the fire victims. He also had made it out safely, but he went back because he had left his grandfather's pocket watch, a family heirloom from the old country. Joe didn't make it back out either. His fiancee identified him after the fire by the pocket watch. It isn't uncommon for me to learn something that puts my own family history into perspective while researching someone else. History can tie people together even though they are not related. I get the same sort of feeling when I'm looking at census records and wondering who the rest of the people on the page are, and how they might have interacted with my ancestors. Neighbors meant a lot more to people back then. The well known genealogist Elizabeth Shown Mills calls this concept the FAN club: friends, associates, and neighbors. Often when you hit a brick wall or can't find documentation, you can prove relationships through researching people in the network and how your family interacted with them. Excellent article! I like your writing style and how you connected your own family to this important historical event.